From one of the six Trappist breweries remaining in the world, this yeast produces the distinctive fruitiness and plum characteristics. 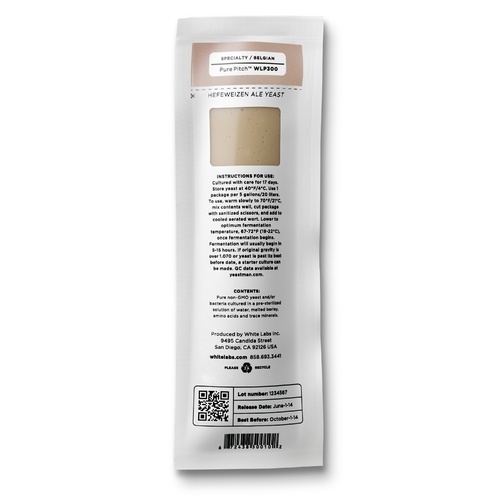 An excellent yeast for high gravity beers, Belgian ales, dubbels and trippels. If you're trying to clone Chimay this is the yeast you want to go with. Pitch at 66-68F and let it rise up 1-2 degrees per day and hold it at 72-75F for 7-14 days. This yeast can dry out a beer no problem. With a starting gravity beer of 1.080 SG we recommend using 8g Fermaid K (AD345) in conjunction with this yeast during the first 24-48 hours after pitch. To brew an awesome beer that we made and loved last year. Proper yeast for proper beer. Fantastic if you want a complex, dark, fruity style to your beer. The write up in the catalog and the reviews recommended. Does this take longer than usual to get started? How long? BEST ANSWER: We used it for a 1 bbl batch at the brewery. It was ferm before we left for the day. It was a great yeast, but we prefer 550 which is the Chouffe yeast. AJ, it usually takes about 2 days to see activity in the blowoff container. Do not use a tiny airlock as you will have a mess. I use a 1/4 inch hose and an old 2 qt OJ container and get major activity wuth this yeast. The CO2 may be escaping throught the seal giving you a false indication. Check your gravity after 3 days or so for an acurate reading. 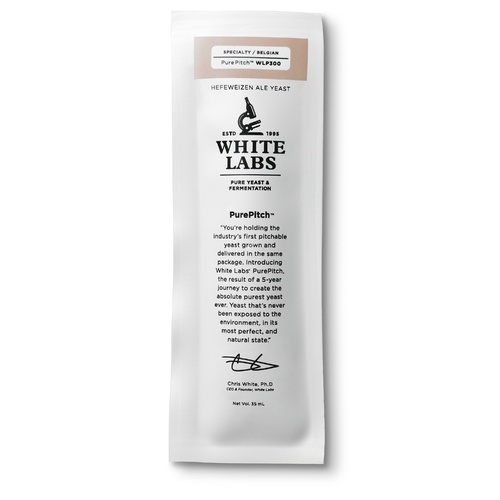 I always use white labs yeast. Making a yeast starter is always recommended if you're worried about lag times. Just pitching the pack straight into the fermenter is going to give you varied results from batch to batch depending on the age and health of the yeast. Well, I was waiting almost 24 hours with no activity in my starter. I wanted to know what to expect. I would thank you for your help, but you have not been of any. which hides the other subtle flavors when drank earlier than that time. As a side note - I did an A/B test with the WLP500 Monastery and the WLP530 Abbey. Split a 10 gallon batch. After 19 days WLP500 was at 1.010. kegged and drank. These two yeasts are pretty similar but I like this WLP500 better - maybe because it sat for one more week. So not the best A/B test I guess. However I did enjoy all 10 gallons, so it was a successful test in that regard. Thank you so much for your extremely detailed feedback. We really appreciate the honesty and value great feedback like this as it helps us improve our products. We're very happy that you are satisfied with the yeast. Cheers! This yeast is one of my preferred Belgian strains because it keeps the phenols lower than most, avoiding any overpowering sharpness that may make the beer seem one-note. This makes it a great contender to use in uncommon styles, like hoppier belgian/IPA mashups, or stouts and the like. It ferments like an animal, so remember to keep a large amount of headspace. This yeast grows well in the starter and was fully engaged after 24hrs in the carboy. It gives a clean-tasting malty belgian taste with solid attenuation. It tolerates high OG very well. I love this for my Trappist style ales. Ferments strong and hot, so pitch cold and let it do its thing. Highly recommend using a starter, otherwise you will get unwanted flavors and aromas from stressing the yeast. Love WLP yeasts and because I mainly focus on Belgians this is one of 3 go to's from them! Great overall flavors and tolerance to high gravity beers! Have used in a belgian blonde and a dubbel, good stuff! ...to my best Belgian beers. This yeast takes a log time to drop clear after fermentation, but it is worth the wait. A good balance between malty and esters. Fairly low in phenolic character. I've done many brews higher then 1.080 O.G. without any problems. Finishes slightly sweet. I try this for a Tripel and guess what? I won a local contest. After I used the same yeast and got a dubbel perfect. This is my preferred yeast for Belgian style beers.